No book can make you happy. This book will teach you all about how your feelings work so that you will gain more control over your emotions and be empowered to make yourself happier. 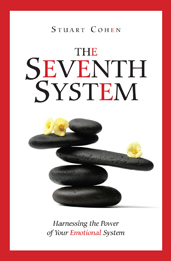 The Seventh System introduces you to your Emotional System, a natural human system like your immune or respiratory system. The Emotional System encompasses all your feelings. Reading this book will teach you how the parts of the system fit together and how to move from uncomfortable emotions to more satisfying ones. You will become less likely to get stuck in feeling miserable. You will develop the skill to bounce back to a state of emotional balance that is the strongest position from which to face the future. You will suffer less and struggle less. Getting to know your Emotional System will allow you to be emotionally healthier, now and in the future. You will still have your feelings, of course, both pleasant ones and difficult ones. But you will have more control of your life as you learn to pass through the discomfort of painful feelings more quickly and back to the pleasurable feelings you enjoy. The Seventh System is written in clear, readable language. Over 60 case histories told as personal stories illustrate the text with examples. Look over the quotes from the book on the “Quotes” page. Sample some of the blog entries, and leave a comment. If you find something that intrigues you, you can order the book from this website by clicking on the “Buy Now” button, or click on the Amazon link for the print or Kindle version. Follow us on Twitter by clicking on button to your left, or become a fan on Facebook. Get to know your Emotional System. You’ll have a happier and better life. The events and experiences that first led me to discover the human emotional system occurred on a journey to the Nepal Himalayas. Scenic images on these pages are from that journey.